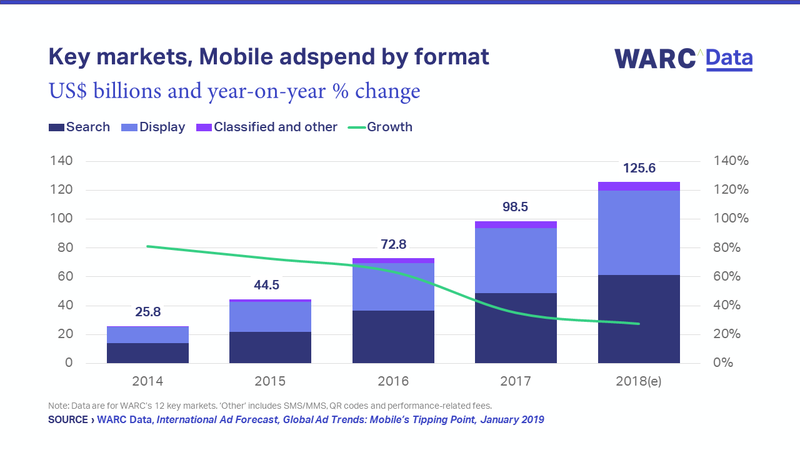 Of the $125.6bn spent on mobile ads in WARC’s key markets in 2018, almost four in five dollars have entered in the last five years. Mobile ad investment has grown at a compound annual rate (CAGR) of 48.6% since 2014, compared to 3.9% for all media. While mobile growth has eased over the period, it remained rapid at 27.6% in 2018. Just under half (48.9%) of the total was assigned to paid search last year, with the majority of this $61.4bn going to Google. The world’s largest media owner accounted for 94.1% of all mobile search queries worldwide in 2018, and derives 65% of its ad clicks from mobile and tablet users, according to data from Merkle. Mobile display formats such as video, branded content and banner ads, drew 46.4% of all mobile adspend across key markets in 2018 – $58.4bn. Spend has grown at a CAGR of 51.2%.